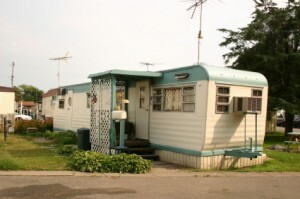 Living in a trailer park on the border of Westover Air Force Base in Massachusetts had some good points.There were some weird points too like my grandfather duct taping most things down in our trailer because the gigantic C-5’s would take off right over our little home and the vibrations would scatter things off tables and even my crib would scurry across the floor like loose marbles. Then there were the lessons I learned living in that little park like how to behave when you lose your undies. In front of hundreds of men. My grandfather being a veteran of WWII taught me to wave to these men that deserved our respect. My mom waved too but I think the boys waved back at us for different reasons. With her bright green eyes and wavy chestnut hair that reached below her waist, my mom was a vision in her Bohemian t-shirts and jean shorts. I think back now of what my grandparents were thinking in the late 70‘s moving with their teenage daughter and her baby into a trailer park so close to thousands of men. Sometimes if it was too hot to sit still my grandmother (Meme - French Canadian slang for grandmother pronounced Meh-Mey), mom and I would walk down Westover Road to the icy cool of Cumberland Farms for ice cream (ice cream sandwich for Meme, Italian ice for mom and Creamsicle for me.) It was a good walk, a half mile down the main road to the convenience store near the gates of the base. On this particular sticky summer evening, the boys must have been returning from successful maneuvers because there was a long caravan of military trucks and soldiers in wildly good moods whooping it up as they drove back to base. Meme was walking closest to the road with me in the middle and mom holding my other hand. Mom got a lot of honking and whistling that night before the event even happened. Meme as usual, was wearing a housecoat that she had made. She was one incredible seamstress and fond of pastel floral fabric. I remember she was holding my hand with her left hand and with her right hand she was holding her rosary beads in her pocket as she always did. As we walked and the trucks slowly drove by us I felt my grandmother’s hand slip out of mine and as I turned to look up at her I saw her granny undies slowly sliding down until they were around her ankles. The rubber band waist had chosen an inappropriate time to give way. Meme then did the most amazing thing. With the soldiers beeping and hollering and my mom mortified as her mother’s undies landed around her ankles, Meme stepped out of her undies and without looking down or skipping a beat we kept walking, leaving her white granny undies on the sidewalk on Westover Road. I remember looking up at my mother who kept looking back at the undies on the asphalt. Meme never did look at my mother or at me. She held tightly onto my hand and said to my mother “Jacqueline, we’re walking. Walk.” And we did. We walked all the way to Cumberland Farms for our ice cream and walked all the way back home without saying a word. In fact, we never spoke of this again. I’ve thought about the “Undies Incident” often in the past year since The Perfect Life I had imploded, especially in the last few months since I started The Happy Girl Experiment. I’ve been hitting myself over the head (metaphorically speaking) and wringing my hands (not metaphorically speaking) and rehashing what I did or didn’t do or said or should have said and I wonder if I could have changed the outcome of any of it if I had acted as Meme did. Could I have handled any of the life-changing devastating things that happened in the past year somehow differently? I am amazed with Meme for the grace she showed when she must have been humiliated in front of hundreds of men who clearly saw her losing her undergarments and what should have been her dignity. I realize that all these years later Meme has taught me an invaluable lesson for when I do something embarrassing or stupid and I just want to collapse into myself like a dying star. What I learned is that you may do something humiliating or something may happen in front of others that horrifies you and you have two choices. 1.) You can acknowledge it and be mortified and apologize and rehash it over and over and hit yourself over the head for being a dumbass. 2.) You can acknowledge it for a millisecond and move on. You may slip on something, fall and drop your full tray in the cafe at dinner on your very first day of college (Yes, I did that) or you may say something you shouldn’t have and you didn’t mean to get around to EVERYONE or in a conversation at work you say how you think people who own boats are pricks and yes, your boss who owns a Chris Craft yacht is standing there sipping his coffee as you say it. Get over it. Whatever you did or said is done. The best thing for everyone is to move forward, say you’re sorry and mean it if the situation calls for it but close the door and be done. You may lose your undies or your humility for a second maybe even in a very public way but you do have a choice to make in how the aftermath plays out. Next time you so something that makes you feel stupid or embarrassed or humiliated remember Meme.